Just a few miles from Deal is the port of Dover with cross channel ferries to France and the iconic white cliffs of Dover. 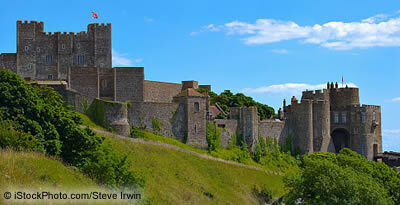 If you are staying in Deal it is well worth making a trip to Dover castle. Dover castle sits high on the cliffs and has superb views of Dover town and across the channel. It is one of English Heritage’s star attractions. To find out more about Dover, see this handy guide to Dover. Dover castle is much more than just a Norman castle. The tunnels beneath the castle that were used during world war two are now open to visitors. They give a fascinating glimpse into the war years and the secret work that went on deep beneath Dover castle. There are also events throughout the year. You will need the best part of a day to do full justice to all that Dover castle has to offer. Dover Museum and Bronze-Age Boat Gallery is also well worth a visit. From the oldest known seagoing vessel to Saxon jewellery and Roman pottery. Dover museum gives a real sense of the Dover’s long history. The lovely cliff top walks make Dover popular with walkers. Dover also has plenty for water sports enthusiasts too. This entry was posted on Saturday, July 1st, 2017 at 12:41 pm	and is filed under Attractions. You can leave a response, or trackback from your own site.